Thursday of last week was Tomb Sweeping Day. This is a national holiday which is set aside for remembrance of the dead and as the name implies taking care of and cleaning the tombs and cemeteries. One of the customs is to make small fires in which you burn paper money as a gesture of sending money to departed loved ones. Many stores sell paper money that is intended just for this purpose. Another teacher I know had bought some of this paper money, not knowing exactly what it was, to use in a class. He said that it was a strange class. It made the students very nervous and most of them would not touch the money. It isn't too surprising, when you think about it, that Chinese people would want to send money to their ancestors in the afterlife. In life they are under great social pressure to take care of their parents. Many people have told me about sending money to their parents or wanting to buy their parents a car or wanting to buy them a house. I think of the small fires as a sort of continuation or extension of this cultural habit. Like any good pyramid scheme the money is always going up the chain to the people at the top even if they're dead. It makes me wonder what might have happened if in 1903 Charles Ponzi had arrived in Beijing instead of Boston. Because Tomb Sweeping Day is a national holiday everyone in the country gets the day off. Most places close for the day. NDI does not. Since NDI doesn't close they had to stagger our extra days off. So because of the national holiday last week I had three days off this week. 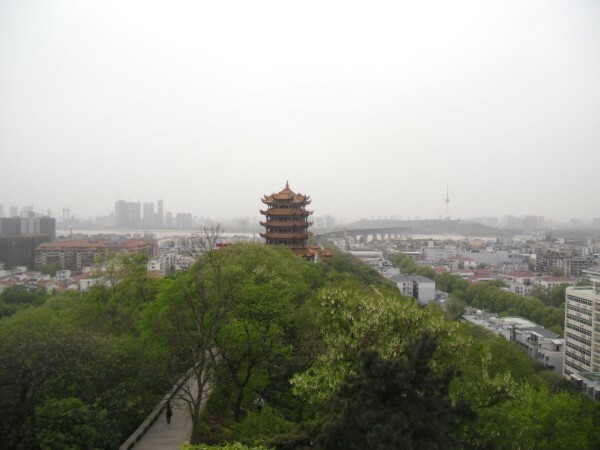 The Yellow Crane Tower (YCT) is probably the most historic attraction in Wuhan and yet after two and a half years I still had not been there. I've seen most of the temples in Wuhan and many museums but never the YCT. I've had many Chinese people tell me that the YCT is not worth going to because they think it is boring and too expensive. At the same time most foreigners tell me that it's well worth the visit. This is probably a matter of perspective in that the closer to and more familiar you are to something the less impressed you are with it. A Chinese friend of mine who works at Mr. Mai's just told about a French person she knows (there's a lot of French people in Zhuan Kou) who used to live in Paris. He would see the Eiffel Tower every day as he walked to and from work and he never thought anything of it. The Eiffel Tower was nothing special to him. It was just another structure that made up the background of his daily life. Chinese people and especially people from Wuhan don't seem to care much about the YCT. It's just another structure that makes up the background of their lives. For me it was somewhere in the middle. I thought that it was interesting but having seen two or three dozen similar structures it's not quiet as impressive as it would have been to me two years ago. It isn't really fair though to say that it is just another building. Inside the YCT park there is also the Millennium Bell and the White Ridge Pavilion. The White Ridge Pavilion is a three story structure that stands on a hill opposite from the YCT with the Bell in the middle. At the top floor of the White Ridge Pavilion you have a clear view of the YCT surrounded by trees and flanked by the modern building of the sprawling city. Behind the tower is the Yangtze River with more of the city sprawled out beyond. Looking at this scene it is hard to think of the YCT as just another building because there is nothing else around that looks even remotely like it. The YCT is probably the oldest building in the city and yet it looks like one of the newest. This might be because a good portion of the 80 kuai admission fee goes towards keeping the place presentable or it could also be that when it was built (and later rebuilt when it was moved to it's current location) it's builders intended for it to be around for a while. Most of what is built today is done very quickly and with no intention of being around far into the future. The YCT stands apart in other ways. It is architecturally different. Most of the other buildings in view are square blocks with flat roofs; buildings that look old, dirty and crumbling. The only other exception to the scene is the 1911 Wuchang Uprising Museum. The 1911 Museum looks like an orange V laid on it's back. It looks almost futuristic. These two buildings are far enough apart that neither detracts from the view of the other but close enough that a person only has to turn to about 90 degrees look from one to the other. You can't see it in the picture below but the 1911 museum is to the left of this position. They look nothing alike and yet neither of them seems to fit in with the rest of the city. The 1911 Museum is new enough that it is still fairly impressive though I suspect that in another twenty years or so people from Wuhan will be much less impressed. The contrast of old and new (er) is great. And, yes you are right before long the new will be looking like the old. Now back to this thing about sending money to those who have gone beyond**************hummmmmmmmmm. Oh, and one more thing----please don't eat the chicken!